yine uyelerimiz arasında bulunan göçmen avukatlarımızla bağlantı kurmalarını sağlayabiliriz. Ayrıca, gerektiğinde, ATASC olarak, mahkemelerde ve/veya sınır giris kapılarında tercümanlik desteği de verebiliriz. ATASC’ye bağlı tüm Yönetim Kurulları, göçmenlik haklarına ve insanların istediği dini seçme hakkına saygı duymakta ve bu hakkı savunmaktadır. Her zaman olduğu gibi, Atatürk’ün ‘Yurtta sulh, cihanda sulh’ sözlerine bağlıyız ve bütün göçmenlerin yanındayız. Üyelerinin çoğu, kendisi veya ailesi göçmen olan bir dernek olarak, nefret ve ayrımcılığa karsıyız. Hiç kimsenin, uyruğu, dini, rengi, cinsiyeti, dili, doğum yeri nedeniyle yargılanamayacağına inancımız tamdır. Amerika Birlesik Devletleri göçmenler tarafından kurulmustur. Unutmuyoruz ki, dünyanın önde gelen sirketlerinde, pek çok bilim insanı, vizeyle çalısmaktadır. Kaliforniya’da yasayan Amerikalı Türkler olarak, her iki kimliğimizden de onur duymaktayız. Representing the Turkish American community in Southern California since 1953, ATASC feels extremely concerned about the President of the United States’ executive order blocking entry of refugees and travelers from seven predominantly Muslim countries into the United States. We understand and share our members’ frustration about the process and would like to remind all of our members to stay informed during times of confusion like now. We have many experienced immigration attorneys among our members who could provide legal aid. If any of our members would like to get help or reach out to any of these professionals please contact us at info@atasc.org. 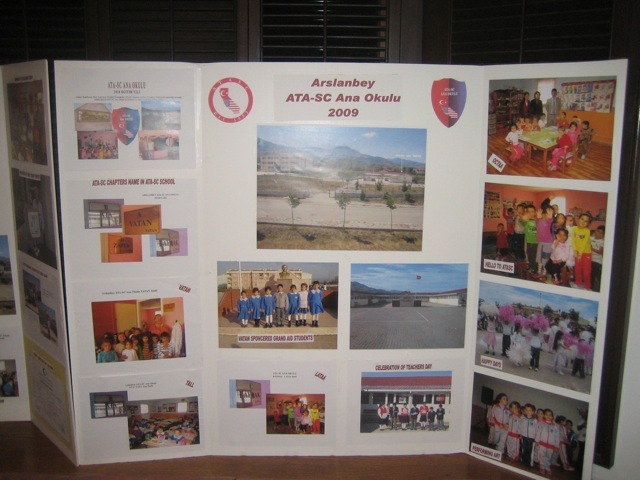 In addition, ATASC would like to offer translator service in Turkish/English in case of need at borders and/ or courts. ATASC boards stand by with immigrants’ rights and choice of religious rights! As the founding father of our motherland, Mustafa Kemal Ataturk, said, we believe in “Peace at Home, Peace in the World.” And, with that belief of peace in our hearts, we, the Turkish Americans of Southern California stand in solidarity with immigrants and immigrant rights. We are a non-profit organization representing our members who are mostly immigrants or descendants from immigrant families. We believe in promoting peaceful cultural exchange. Hate and discrimination have no place in our world. Residents of the United States cannot be judged by their country of birth, nationality, citizenship, religious belief, color, race, or gender. America was built by immigrants. Let’s remember; under H1B1 visa status there are many scientists working for American companies in America that lead world industries. We are proud Turkish Americans and proud Californians who are also very proud of our Turkish Heritage. Dear Members, Turkish American community and Jewish societies, you are cordially invited to an award winning documentary screening event with guest speaker Victoria Barrett, the producer of the documentary. 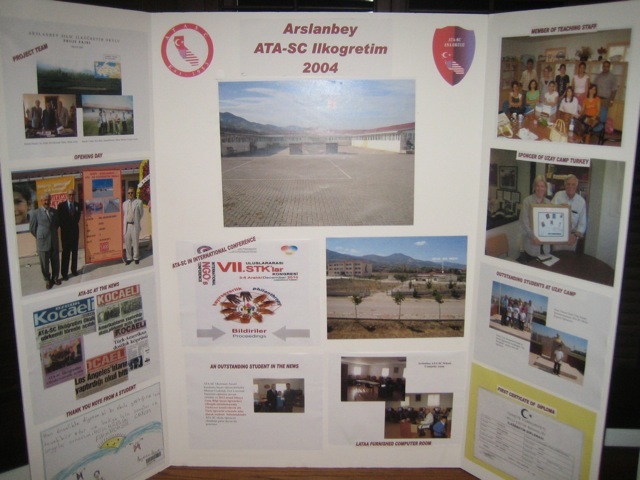 Association of Turkish Americans of Southern California once again proudly organizing an other enchanting event. ATASC is welcoming Victoria Barrett the producer of Desperate Hours documentary. 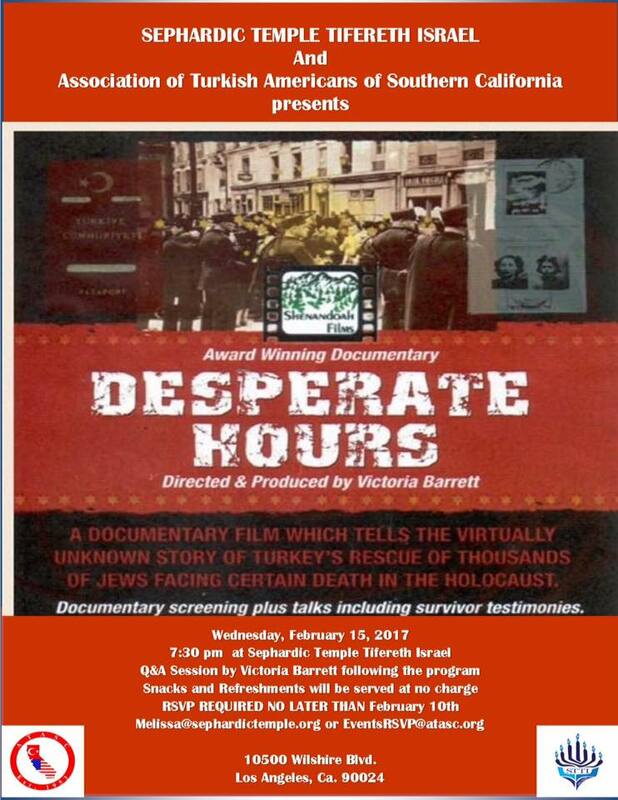 Desperate Hours is a documentary film which tells the virtually unknown story of Republic of Turkey (Turkiye)’s rescue efforts of thousands of Jews facing certain death in the holocaust. Kosher dishes will be served. All welcomed! Kindly invite family and friends. We are thanking STTI for opening their doors to us and co hosting the event. Parking: available in the premises.